Most existing evaluations of prison-based parenting programs are limited by small sample sizes and brief follow-up periods, and all rely on self-report measures, which raise concerns about the social desirability of fathers’ responses. A major research gap is understanding how to bring these programs to scale in criminal justice systems and preserve their implementation fidelity. Moreover, evaluations have generally not investigated program mediation to determine the pathways through which programs work and what core programmatic elements are most effective. Quantitative measures assessing intended outcomes over time are necessary to document program effectiveness. Evaluations of different types of programs, including individual and group counseling around parenting issues, are needed. Program evaluations need to include larger and more diverse samples as well as assessments of children and other caregivers. Future work should also examine the mediating role of parenting practices in program effects on child well-being. Almost no research has examined the effectiveness of family strengthening programs for fathers across the reentry period. Beyond program descriptions and estimates of the number of families that participate, there is little evidence that efforts to improve partner and father-child relationships upon reentry and after release have positive implications for father or family well-being or reentry and post-release success. 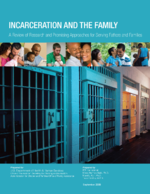 Future work should build on the research that has evaluated the efficacy of prison-based family strengthening programs and the scant evaluation research on programs like La Bodega de la Familia. Specifically needed are studies that randomly assign reentering fathers and their families to relationship enhancement programs versus control groups and follow them over time to assess outcomes. Moreover, it is important to conduct evaluations of programs currently implemented in several states that begin during incarceration and continue after release, as this approach is predicted to yield the most positive outcomes (Bobbitt & Nelson, 2004).